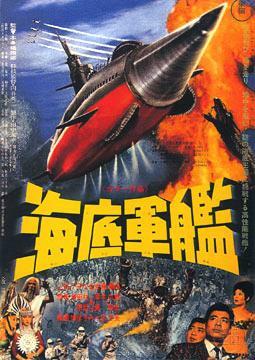 Atragon, or Atoragon, was released in Japan with the title Undersea Warship (海底軍艦 Kaitei Gunkan). First of all I think the acting was overall much better than in most tokusatsu films of this period. I wouldn’t say any of the roles was a ground-braking oscar-winning one, but all the major actors performed well and their acting ties in well with the plot and does not draw the viewer away from the story. Jun Tazaki and Ken Uehara perform their roles well, so does Yoko Fujiyama. While the father-daughter relationship between the two characters may seem a bit artificial and formal now (especially to western viewers), these were the 60s in Japan and if you look at it from the period’s perspective, it doesn’t seem unrealistic. Tetsuko Kobayashi has a minor role as the Empress fo the Evil Mu empire, but she performs her role very well IMHO, with the limited amount of lines her character is given, Kobayashi “fills in the blanks” with facial expressions and the final outcome is positive. She does not go overboard with the “moustache-twiching bad guy routine”, insted her play is subtle but strong. Akira Ifukube did a good job here in my opinion. The soundtrack and especially the Gotengo theme are fun, catchy and fit the story very well. This is definitally one of the film’s strong points. The main plot is somewhat your typical 60s SF-fantasy film with an evil civilization threatening earth hoping to conquer and turn everyone into slaves. There is a twist though, as this time its not aliens from space, but people from the lost Mu continent that was sunk thousands of years ago. In a way the story pays tribute not only to classic Mu/Lemuria/Atlantis legends, but also to Jules Verne books. While the plot is not very fast paced, there are no “filler” scenes and each scene somehow contributes to the overall plot. I would also like to add that despite some comments in the Kiaju fandom, the Mu are not portrayed as a “primitive” civilization. They have modern-looking submarines, have destructive laser beams, some sort of “flying bombs”, wetsuits that seem superior to regular human ones, they mastered geothermal power, they posess small but very powerfull explosives similar to plastique, have technology that allows them to heat up various objects at will and last but not least they have a device that can cause earthquakes. I wouldn’t call all that “primitive”. True, their palace guards carry spears, however I see them as the equivalent of human police carrying nightsticks. These are just the “law and order” guys of Mu, not its army. The Mu society is visually similar to ancient Egyptians, which is yet another element typicall for early 1960s films. The inclusion of an “ancient” theme was likely inspired by the sucess of films like “10 commandmends”(1956), “Ben Hur” (1959), “Hannibal” (1959) or Cleopatra (1963). This is where SF meets real life politics. The film was made in 1963, only 18 years after the war ended and 20 years after the death of Admiral Yamamoto at the hands of US pilots. There was a lot of tension between contemporary pacifists (including leftist youth groups like the Zengakuren) and conservatives over issues like national defense, US bases on Japanese soil or the Japan-US Security Treaty. In Atoragon you can see things that you wouldn’t often see in contemporary “realistic” japanese films – the hinomaru flag, sailors in WW2 garb and last but not least the war-obsessed conservative Captian being one of the good guys. Indeed, the tensions between Tazaki’s and Uehara’s characters is an allegory about contemporary japanese political issues- the clash between old-school conservative-nationalists (represented here by Captain Jinguji) and the pragmatis-reformists (represented by ex-Admiral Kosumi). “Serious” cinema of the period always followed official propaganda that condemend the old nationalits and praised pacifism. Atoragon however delivers us a different message – while it condemns the extremes of both viewpoints, it depicts both the nationalists and pacifists as good people that need one another and should work togeather to protect japan and build a better future. I think that was the most popular view of that era and Atoragan, precisely because it was a fantasy “not-serious” movie, was allowed to depict this despite going against offcial propaganda. Another, but related story is that of a generation gap and tension between captain Jinguji and his daughter. We should remember that the film’s initial target audience (20-something year olds) were all born duing the war and most likely had parents who either fought in WW2 or worked for Japan’s war effort. Again, this was a very common socail issue in early 1960s Japan. Atoragon gives us a bit of social allegory here, again stressing the need for both generations to seek to understand one another and work togeather. 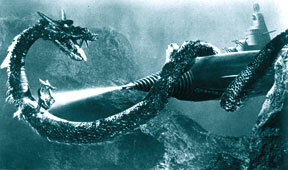 All in all, I think Atoragon is the most socially and politically heavy of Toho’s 1960s tokusatsu films. This is not necessarily bad, but its important to understand this and the socio-political context of the times to get the most out of the human plot of this film. The special effects, like in most 1960s Toho films, are very good and amongst the bets of the best in the world in that time. Exploding ships, effects of an earthquake, buildings collapsing, the explosion in Mu – they all look fun and realistic – even if you know they are all scale models. The effects, while not as impressive as modern CGI, still look good after 50 years. Props in this film are good, better than in many contemporary tokusatsu films. /the merchant japanese vessel has adequate uniforms, which are different from the crew on the American submarine, which again are different from the uniforms of the Gotengo crew. All look realistic and not the paper-mache-tinfoil pseudo space suits taht you can see in a whole lot of 60s films. The only “bad” props in my opinion are the freeze ray rifles used by teh gotengo crewmen at the end. The good thing you won’t see them on screen for very long. Both the US nuclear sub and the Mu submarine models are nice and believable. The Gotengo model is one of my favorite Toho designs and I think its not just my own opinion, but the opinion held by the vast majority of tokusatsu fans. And here we have the sole kaiju of the film – Manda. 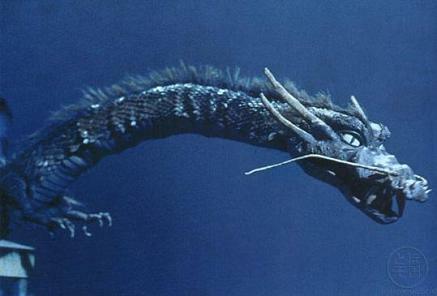 Manda is an underwater chinese-style sea dragon. First of all I think its an original and fun idea to have a kaiju that appears and fights underwater for the whole time and I should add taht the underwater scenes look well and do their job. What I don’t like is that the Gotengo-Manda battle is very anticlimatic. In fact all the Gotengo-Mu fights are anticlimatic in the film. The fact that there is hardly ever any serious threat to the Gotengo and that there is no dramatic, evenly-matched final battle really does hurt the overall feel of the film. The Good: Nice special effects and props, great music, pretty good acting, interesting designs of vessels and kaiju, the “evil empire with a twist”, cool underwater scenes. Other: The human plot is not bad, but those not familiar with Japanese history and politics may fail to grasp the meaning and context of the social commentary made in the film. Also, the film is mostly set at sea or in remote locations, so you won’t get too much of Showa-era nostalgia here, other than the clothes worn by the civilian characters. Posted on September 4, 2011 0 By Jon D. B.	Kaiju Movie Reviews! Posted in Kaiju Movie Reviews!, Toho Movie Reviews!